INDIANAPOLIS -- A forgotten hero from the 1950s shared his story Thursday evening, 50 years after his actions. In 1952, seven Soviet aircraft attacked a US Navy squadron off the coast of North Korea. Captain Royce Williams shot down four of the fighters, forced the three others to retreat, then landed his badly damaged aircraft on a carrier. The events stayed classified for 50 years. 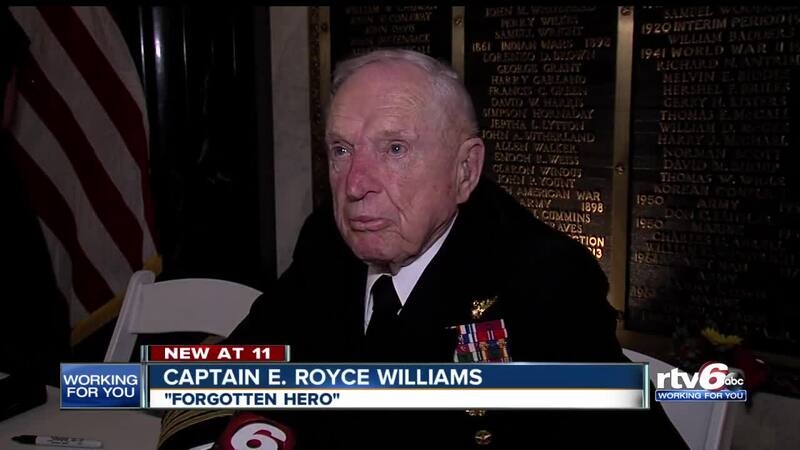 Williams, now 93, spoke Thursday at the Indiana War Memorial after a screening of a new documentary about the attack. "I was able to say that I was involved in it but not who they were or how many I shot down," Williams said. "I only got credit for one." The 1952 incident is the only known attack on the American military ordered by Soviet forces.